It only took a year for the internet to notice, after Andy Baio, CTO of Kickstarter and a veteran blogger, called attention to a Reddit thread posted on Sunday lamenting the MySpace failure. The issue surfaced in a Reddit discussion early last year as MySpace users realized they could not longer stream songs stored on the social networking site. The initial explanation was that there was an undisclosed technical issue that was being worked on. Eight months ago, a Reddit user reported that the company had changed its tune: "As a result of a server migration project, any photos, videos, and audio files you uploaded more than three years ago may no longer be available on or from Myspace. We apologize for the inconvenience and suggest that you retain your back up copies." The message advised contacting the company's data protection officer, Jana Jentzsch. The Register has attempted to do so but has not received a response. We've also reached out to the company's media relations group to no avail. Frankly, we're not sure if there's anyone home. Other MySpace users have posted screenshots of messages from the tech biz that appear to confirm the problem. 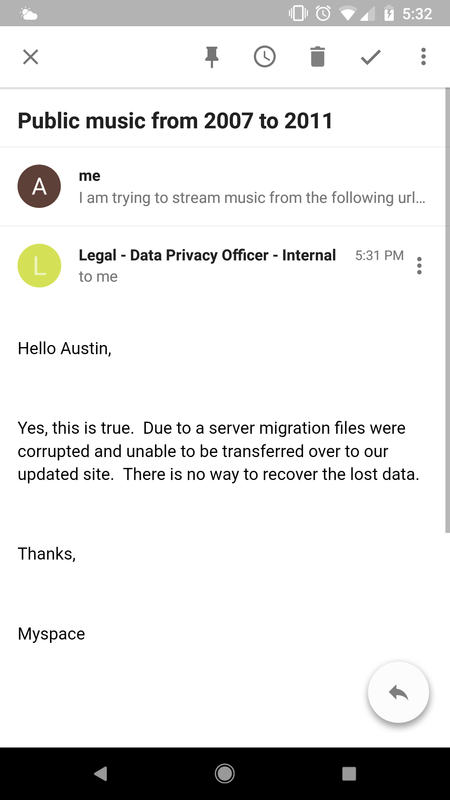 The message, purportedly from the company's data privacy officer, says, "Due to a server migration, files were corrupted and unable to be transferred over to our updated site. There is no way to recover the lost data." That was seven months ago, shortly after Meredith Corporation completed its acquisition of MySpace parent Time, which picked up MySpace in 2016 after previous stints under Specific Media and News Corporation. A spokesperson for Meredith didn't immediately respond to a request for comment. Baio in a follow-up tweet expressed doubt that the data deletion could have been inadvertent. "I'm deeply skeptical this was an accident," he said. "Flagrant incompetence may be bad PR, but it still sounds better than 'we can't be bothered with the effort and cost of migrating and hosting 50 million old MP3s.'" Other tech-types voiced similar views. Laurie Voss, co-founder and chief data officer of NPM, said, "It is unbelievable that they didn’t have more than one copy of this data, as in: I do not believe them when they say they lost it." The MySpace support website offers a grim though non-specific message for those looking to access old files. "If you are looking for something that is not on this list, that means the content is no longer available and cannot be retrieved," it states.